You might have seen the hints I’ve shared on my Instagram the past week, but I have an exciting collaboration with SKM, a well-known Belgian multi-brand fashion store. Together with a few others, I was invited to take a peek at the renewed store in Aartselaar and discover the new brands while sipping cava. Among the newcomers was Liu Jo, an Italian fashion brand that is known for it’s elegant and sophisticated designs in sometimes extravagant colors and prints. Those who know me know that I’m not one to sport over-the-top fashion, but I was pleasantly surprised by the selection the buying team from SKM choose for their store. I fell in love with this parka-style jacket with a collar embellished with gold and silver jewels. It pairs lovely with the frilly Tommy Hilfiger top, but it looks even more beautiful when worn over my white lace dress. Today I wore it over a little black dress with simple black boots and opaque tights and I may have also got a look in mind with my new silver brogues that are coming in next week. 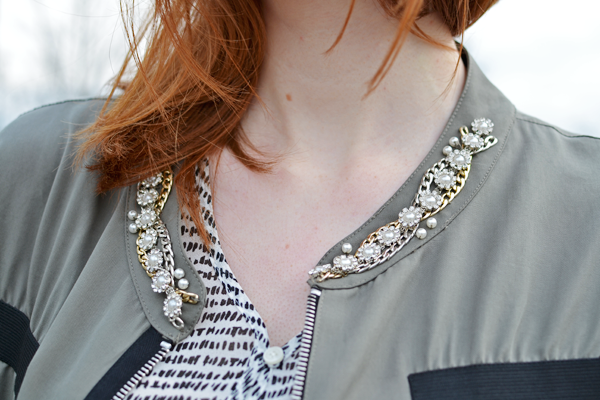 Just to say you’ll be seeing this gorgeous piece a lot on The Ginger Diaries in the months to come! My eye also fell on this frilly chiffon blouse. The past year I’ve noticed that I wear my blouses more and more, so it was only logical to pick up a fresh design for Spring. The subtle TH-print and basic colors make it a perfect match for my existing wardrobe. Not only does the blouse give this casual city outfit a more dressed up feel, it also looks beautiful with my trusty red blazer, my black jeans, black leather shorts, black blazer, … . The possibilities seem truly endless. If our shopping mission was to find our new wardrobe staples, then I guess my shopping spree was a success! I would want to thank SKM for this beautiful opportunity, the great help and support during the evening, the amazing appetizers and my new wardrobe staples. Keep an eye on the Belgian blogging scene if you want to see which items my fellow bloggers have picked out and get a better idea of the new brands and collection available at SKM. Congrats on such a great collab! Love the top. Het jasje is echt een kunstwerkje en een prachtig item! Mooie outfit! Fijn om je nog eens gezien te hebben. What a fun opportunity- and to support a Belgian company too! Haha je hebt me zowaar nieuwsgierig gemaakt!